How Short Can Your CV Get? Tried a “Twesume” Yet? Posted December 15th, 2011 by Karl & filed under Social. Yes, they’re real. The world of the internet and social media has created and pulled in some strange concoctions over the years, but I didn’t see this one coming. 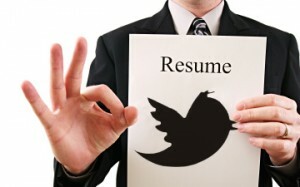 Mashable recently posted about how a “Twesume” could land you your next job. But could it? Could a short 140 character burst really be enough to sell yourself to any prospective employer? Surely this would just look lazy as much as anything else, especially if deployed on it’s own without any additional method of contacting the employer. That being said, supposedly 89% of companies used Social Networks for recruiting in 2011 with 65% of companies having successfully hired via social media; this is a fairly clear indicator that, as Mashable states, Social Media is getting more and more influential. So influential in fact, that there are even events and seminars on how to get the most out of recruiting via social media (and it’s not the only one around). One company has already started using these “Twesumes” as a way to find new employees. I feel it necessary to point out however, that these statistics are more representative of the larger companies in America, and may not necessarily represent the employment agency as a whole. Indeed, the process is probably only applicable to those who can afford to spend real time and effort using Social Media as a vehicle for recruitment. That being said, it still shows that it is a trend on the rise. A quick search for #twesume on Twitter shows that people are already attempting to use this method as a way to reach out to prospective employers. Below are some of the more interesting excerpts I found attached to the hashtag #twesume. Good time to apply I think for Santa. ‘Tis definitely the season. Don’t really understand this one. “Is your #twesume up to date”? Weren’t they just released? How can it not be up-to-date? Possibly speaks the truth for most Twesumes.